I was thinking about what to make for the JFI-Soya event hosted by Sia, went to the local indian grocery store and found soya flour & nuggets. I was thrilled!!! Having found the flour, I didn't know what to make. The only way I've used soya flour, is to add to the wheat flour & make chhapathis. Now, what do I make? Inspiration struck and I thought of soya dosai. Pour in the soya yoghurt and mix. Add water as needed to make a smooth paste. Batter should be a little thinner than regular dosai consistency. Heat a griddle with raised edges, pour 1-2 ladles of batter in the middle in a circle. Sprinkle a few drops of oil on the sides. Cover and cook for 30-40 secs. 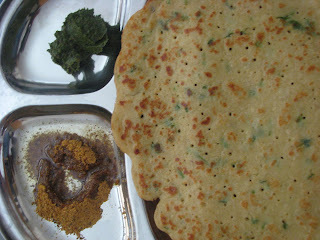 Remove cover and turn dosai to cook other side for 30-40 secs or till dark brown spots appear. This dosai takes a long time to cook as it is thick. Make sure to keep a medium heat setting, else the dosai will turn brown too quickly & won't be fully cooked. So, check the centre before removing from griddle. Tasty by itself or with dosa molaga podi. My husband liked it with kothamalli thogayil too! Soya pancakes looks very tasty!